I made you all wait way too long for this episode, but I think it’s going to be worth it. My guest is a fabulous storyteller who shares a wealth of info that I hope will serve as an audio springboard for all of you dear listeners out there dreaming of launching your own handmade business. You can do it! You can do it! You CAN do it! Kari covers everything from pricing and taxes to social media and starting your own craft fair, so this book is pretty cool and includes a lot of info that I wish I would have known before I decided to launch my own crafty biz. 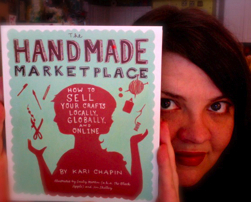 Speaking of which… ENTER TO WIN a copy of Kari’s book by posting a craft business tip below. What do you wish you would have known before you got started? If you haven’t launched a handmade business yet, please post a question. What do you want to know before you get started? The deadline to enter the random drawing is March 21. Good luck! Libby Dibby stuff and style is all about being inspired by the joy of color and pattern – and things that are both vintage and new. Check out skirts, hand-stamped charms, baby slings and bags at libertyworth.com, and one-of-a-kind items at the Etsy store. The Libby Dibby blog is chock full of what inspires Liberty and ideas she shares with readers. Buy a CraftSanity T-shirt or sponsor an episode. Also, check out my etsy shop to see my handmade line of wooden peg looms. If you haven’t already, review the show on iTunes to help get the word out about the show.